You may notice a marked difference in the quality of the photography in this post. For that, I need to thank my friends Michael Schmid, John Sim, and Matt Barraro, for having an awesome camera and technical skills, and for contributing their time to taking pictures of some of my drinks. With the difference being that a fix should be strained over fresh ice into an old-fashioned glass, and a sour should be strained into a cocktail glass or, if you listen to Andy, a sour goblet. A sour becomes a daisy if it is modified with a liqueur instead of a syrup. Adding a bit of liqueur to a sour made with syrup makes it fancy — curaçao or maraschino are the common choices, but any high quality liqueur is acceptable. It is sometimes desirable to thicken a sour or a fix with an egg white, in which case one must first “dry shake” the drink, which is to say, shake it without ice, to foam the egg white, before shaking it with ice. In the winter time, an egg white is very appealing, but in the summer, I usually choose to omit it. Shake over ice, double-strain over fresh ice. Garnish with fruits in season (lychees). I love vanilla-bean infused bourbon whiskey, and I always keep a bottle on hand. It takes about one week for the vanilla flavor to fully mature in the whiskey, though many whiskey-lovers might find that this is treating the whiskey a little too harshly, and indeed, one ought not to give this treatment to a whiskey that is too fine. I wouldn’t go cheaper than Evan Williams, but I also wouldn’t go more expensive than Buffalo Trace or Bulleit. Vanilla brings out the oaky qualities in the bourbon, and adds a little more interest to the relatively commonplace whiskey sour. My friend James made this drink in my house about a month ago, and he chose to use brown sugar syrup instead of simple. Since then, I have made it this way exclusively, and it’s a drink that I will serve to any guest in a pinch. It is proper to garnish a fix with seasonal fruit, as they contribute interesting aromas, and add a fancy, festive quality to the presentation. 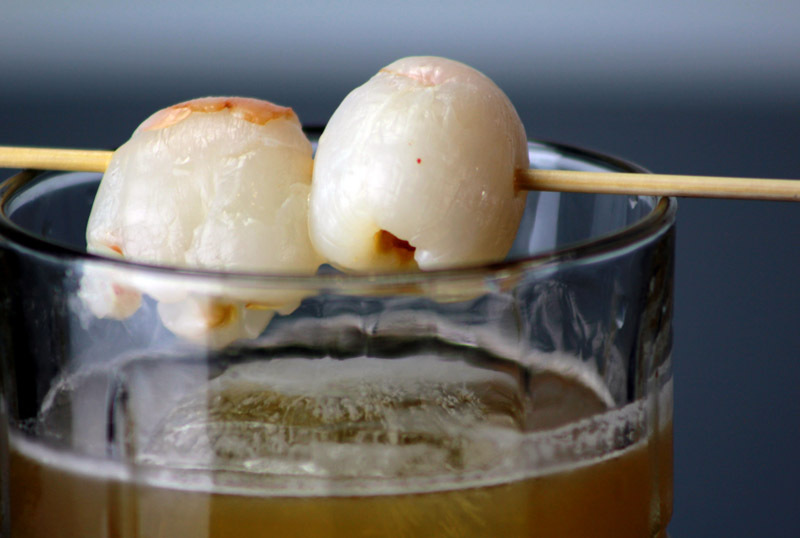 I just happened to have these lychees on the day that we took the pictures, and after de-pitting them carefully with a paring knife, I skewered them with bamboo and set it on top of the glass. Most people don’t eat lychees very often, at least in the U.S., so the opportunity to eat an uncommon tropical fruit adds even more intrigue to the experience. If you don’t have lychees, I have also garnished this with fresh pineapple, and with raspberries, and both are great. Categories: classics, original creations | Tags: bourbon, cocktail, cocktails, demerara, demerara syrup, drinks, fix, lemon juice, sour, vanilla, vanilla-infused bourbon, whiskey, whiskey fix | Permalink. It’s interesting to hear that lychees are uncommon in US. Considering the proximity of where we are to south east Asia, lychees are readily available here and are incredibly popular. 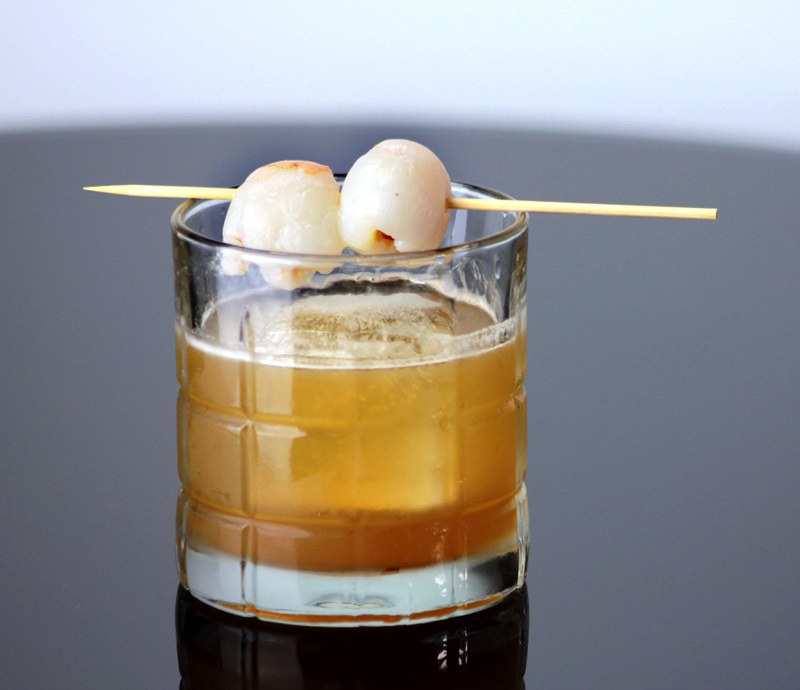 The lychee martini is a drink many bartenders learn to hate here! I like the idea of having a vanilla bean bourbon on hand at all times. Would you recommend just using one bean pod for an infusion? One bean pod is all you need. Take a sharp knife and make an incision along the length of the pod, to expose its innards to the bourbon. After a week, you will have delicious vanilla-flavored bourbon. Do you strain your vanilla infused bourbon? I am currently trying this, but I’m worried some of the black innards of the vanilla bean may be floating around in the bourbon after I remove the bean. If I am making a stirred drink with it I will generally give it a quick strain through a fine-mesh strainer, but if I am making a shaken drink I’m going to do that anyway, so it is not really a problem. For one bean pod – what size bottle are you putting it in? Should I shake it once a day or so? A 750 ml bottle. Agitating it does not hurt. Fascinating – one pod doesn’t seem strong enough for 750ml – but I wouldn’t want it too overpowering, so I’m assuming that’s why?